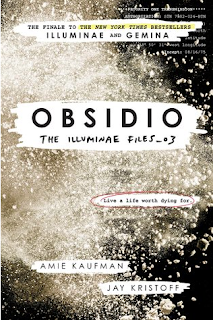 Summary: This is book 3 of the trilogy The Illuminae Files. This review will contain spoilers for the first two books. Here are my reviews for Illuminae and Gemina. With the jump station Heimdall destroyed and nowhere else to go, Kady, Ezra, Hanna, Nik, and all the remaining survivors decide to head back to Kerenza IV on the Mao to see if there is anything or anyone left. And there is. Kady's cousin Asha, having survived the initial BeiTech attack, is now doing her best to survive BT's occupation of what remains of colony. With their jump platform damaged in the original standoff, the BT troops who weren't killed have now taken over. Asha is doing her best to stay under the radar as she helps the underground insurgent movement try to find ways to send out help signals and sabotage BeiTech. Unfortunately for her, as it turns out, one of the newly assigned ground soldiers happens to be her ex, Rhys. And conflicting emotions besides, there are only so many days left before BeiTech fixes their jump platform and kills all the civilians before leaving them behind. And in the meantime, the Mao is on its way. Thoughts: Okay, can I say, first of all, that I've waited what feels like a loooooong damn time for this book? The first two books of this series, I was able to obtain ARCs, which means that I read them well in advance of their official release dates. But they came out a year apart exactly, so the wait wasn't so bad. However, not only did I NOT get an ARC for this book (I'm not saying I'm owed one or anything; I'm just saying that I didn't have one), but the release was pushed a few months out (March instead of October), so believe me when I say that it feels like I've been waiting a LONG DAMN TIME for this book, since I reviewed Gemina in June 2016, and now it's March 2018. Anyway, while I would have loved to have read this sooner, I still will maintain that this was worth the wait. Oh my gosh. What a ride. This entire series has been a ride, but I loved how everything came together, and how everything seemed ratcheted up ten levels--the drama, the dirty jokes, the violence, the FEELS. I devoured this book. I cried, I laughed, I gasped, and I squealed at the collaboration between our favorite space teens and one psychotic, murderous AI with an inability to understand sarcasm. I particularly loved that there was a lot of pushback on the Mao about Kady, Ezra, Hanna, and Nik being in charge of things, because it addresses a particular trope (issue?) about YA, which is "How is it that the major heroes end up being teenagers?" You know what I mean--how realistic is it that the "Chosen Ones" end up being teens, especially teenage girls, right??? People LOVE to scoff at that sort of thing. So in this book, there are tons of adults who question their authority and their expertise, and they're not always successful at handling that pushback, and I thought that was really refreshing and authentic. On the other hand, everything happening with Asha and Rhys, who are college-aged at the very least, is distinctly more adult than we've experienced so far. Rhys, who is a tech specialist suddenly assigned as a ground soldier, has never been in the trenches before (earning him the unfortunate nickname "Cherry" among his fellow troops), and through him we experience a barely censored version of life in the combat zone, especially considering that BT are the bad guys here, and they aren't stationed there to play nice with the civilians. In the first two books, we saw weird, uncontrollable evil in the form of a rage virus and four-headed hallucinogenic parasites, but this book? The evil is all human. And maybe that's what made it the hardest to read of all. We can be freaked out by the Afflicted in Illuminae and grossed out by the lanima in Gemina, but we can sleep easy knowing that it's scifi. However, we can't quite close our eyes to the fact that the slaughter of innocents in Obsidio has always been a part of human history. This isn't what could happen; it's what already has happened. And I think The Illuminae Files offers a wonderful, hopeful vision of what we could choose to be: a motley of flawed but passionate and resourceful people who want to see justice served, truth told, and loved ones remembered. It's a story of regular people who didn't ask for this fight, but got dragged into it anyway, and now they are working together the best they can to right the wrongs committed by people (a corporation, a system) far bigger and more powerful than they are. Obsidio was an amazing ending to this trilogy, and it remains one of my favorite series ever.